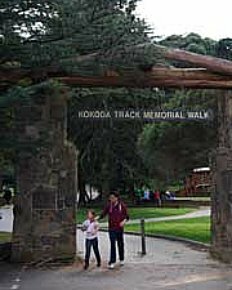 The Kokoda Track Memorial Walk is a really popular walking trail in the Dandenong Ranges. The Dandenong Ranges are a low level tree and fern covered mountain range about 30 kilometres south east of the Melbourne CBD. The Track is close to Upper Ferntree Gully in the Dandenongs so you can get a train from Melbourne city centre or drive. This trail is also known as the Thousand Steps even though there are only about 900 but I guess you lose count after a while! .........Remembrance Day on July 23rd marks the anniversary of the first engagement between these opposing two sides. 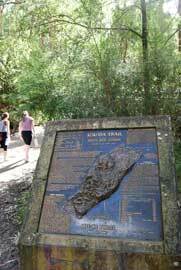 Today the Kokoda trail in Papua New Guinea is a place of pilgrimage for tourists and is a major six-eight day trek. ........Somehow though my ‘tired’ five year old was transformed the moment we got back to the playground at the start of the walk where she completely forgot how ‘tired’ she had been and ran around quite happily for an hour or more! The walk is about 1.8km and I've been told it takes about two hours for the return trip and is quite strenuous. It does get muddy too if it’s been raining so be prepared. The earlier you can get here the better as apparently the steps get quite narrow and the trail is popular with keep-fit fanatics running by. You'll find picnic tables, barbecue areas and toilets at the foot of the walk as well as the playground I mentioned earlier and there's also a cafe here. The start of the track is within about 900 metres of the railway station.